What is LIfe’s a Poodle? Sally and her lifetime friend, Mary, started Life’s a Poodle 8 years ago. They’re two moms who have experienced firsthand the difficulties faced by children who learn differently. Dedicated to raising awareness and seeking solutions for children with learning differences such as Dyslexia, ADD or ADHD, Life’s a Poodle supports programs that promote the success and dignity of children who learn differently. Having a learning difference, or being the parent of a child with a learning difference is not always easy. Sally and Mary have taken the lead in supporting parents with LD children. They have designed a unique Parent Mentoring Program that matches a parent with an LD child with another parent who is further along in his or her journey. For guidelines on how to start your own Parent Mentoring Program click here for our free Starter Kit. 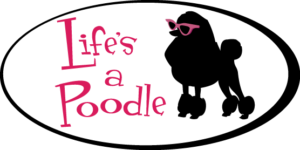 Check out Life’s a Poodle’s latest newsletter – Hat’s Off To Change. Sally and Mary have compiled a comprehensive list of books, videos and websites related to learning differences. Click here to view and download Mary and Sally’s Favorite Resources. If you are a parent with a child who has a learning difference, you do not need to take this journey alone. Join the conversation on Facebook and Twitter, or contact Sally and Mary for additional information, support and resources.